Last week in Las Vegas, Square Enix announcedFinal Fantasy XIV: Heavensward, the first expansion for the magically reanimated MMO. At this weekend's Fan Festival in London, producer Naoki Yoshida showed off new flying mounts, a pair of new beast tribes and an eagerly awaited addition to the game's class roster. 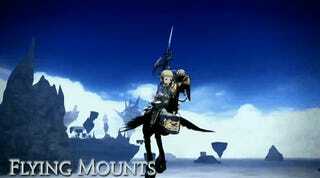 First off, flying mounts. That's mounts with an 'S'. Beginning with the traditional Black Chocobo, which Yoshida said would be players' first flying mount, escalating to single-passenger airships and beyond. The game's flying mounts will be able to free-roam expansion areas, which have purposefully been designed with plenty of floating landmasses to explore. Yoshida also revealed that a certain, unannounced flying mount was being made into a model to be included in the expansion's Collector's Edition when it ships in Spring of 2015. ...and giant creepy bugs, worshippers of an even bigger, creepier bug. Finally we have the Dark Knight, one of the first new jobs announced for the expansion. Heavy hints at last week's event pretty much made this a given. The Dark Knight is a tank class, wielding a two-handed sword and the power of dark magic. Unlike other more advanced jobs in the game, the Dark Knight has no prerequisite — one the player purchases Heavensward, they can be a Dark Knight. Yoshida ended the event's keynote with a tease for the next new job, to be announced December 20 at the Japanese fan event in Tokyo. He removed his Batman (Dark Knight) t-shirt to reveal a 007 gun logo, making shooting motions with his fingers. I'm going to completely ignore that last bit and say it's Blue Mage. You can check out the entire keynote presentation below, for as long as the video lasts — only folks at the event or those who had subscribed to the show's premium stream (Yay I spent $20) could see it.